Those born in this Lunar year are believed to have a gift for communication and public speaking. TODAY WE SAY goodbye to the snake and hello to the horse. 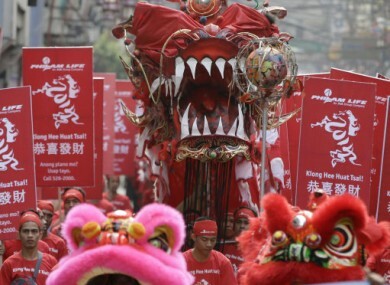 Chinese people, as well as others of Southeast Asian descent, will today be celebrating the Chinese New Year and the beginning of the Year of the Horse. Lunar New Year as it is more correctly titled is the beginning of the Spring Festival and celebrations begin from the day previous until the 15th day in the first month, making it the longest festival in the Chinese calendar. This year the last day of the festival falls on Valentine’s Day. The horse is the seventh of the twelve animal signs in the Chinese zodiac calendar and those born in this year are believed to have a gift for communication and public speaking. Chinese New Year is the cause of the world’s largest annual human migration as families gather to for a reunion dinner with railways and infrastructure often struggling to cope with numbers the travel period is known Chunyun. It’s been estimated that Chinese travellers will make 3.62 billion trips during the course of Spring Festival this year. The Chinese community in Ireland will also be celebrating the beginning of the 4712th year of the Chinese calendar, with Dublin City Council putting on a series of events for the seventh year. A concert night presented by China Conservatory of Music will be held tonight in the Chester Beatty Library with DIT Conservatory of Music also playing traditional Irish music. Dublin Chinese New Year Festival aims to create an opportunity to celebrate the festival with the local communities and also to promote exchange between the Irish and Chinese cultures and histories. With the relations between Ireland and China deepening, we aim to promote further the integration of Chinese communities in Ireland. Yang says that the Chinese community is one of the largest immigrant communities in Ireland and has roots going back decades, celebrating Chinese New Year is one of the most important traditions Chinese people here celebrate he says. Email “It's Chinese New Year! Everybody welcome the Year of the Horse ”. Feedback on “It's Chinese New Year! Everybody welcome the Year of the Horse ”.